Home buying is one of the biggest emotional and financial decisions that a person ever makes and a great deal of thinking and planning goes into this decision-making. Apart the usual factors taken into consideration while buying an under-construction residential property, timely possession of the desired project is of utmost importance. 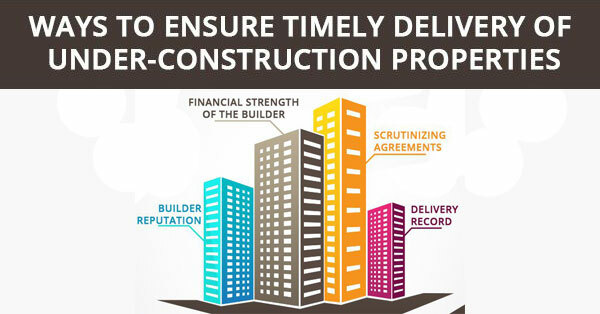 Delayed delivery of residential projects is a common problem in India and it is the buyers’ responsibility to be cautious and not get locked in on a delayed project, as this can adversely affect the buyer in multiple ways. Extended Waiting Period: The dream of buying or moving into a new home is often coupled with great expectations and happiness. When the construction schedule goes off the track causing an extended waiting period, the buyer goes through stress and emotional trauma while tackling this difficult situation. Extra Home Rent: Especially for first time home buyers, delayed possession date is a severe blow. They will have to shell out extra rent for their current accommodation as they won’t be able to move in to their new house as planned. Some of the factors that cause delay in timely completion of projects are improper planning & co-ordination, lack of commitment to deliver as promised, unfavorable economic scenario and poor management of cash flows. Operational drawbacks like shortage of supply material, lack of skilled workforce, over-dependence on sub-contractors and bureaucratic delays in getting regulatory clearances also contribute to the delay in construction schedule. Builder Reputation: It is of paramount importance for the home buyer to properly verify the builder’s reputation and credibility. A check of how long the developer has been active and the number of projects delivered would give a good idea of the builder’s market credentials. Too many deals and offers that appear too attractive to be true could also be a red flag. Financial strength of the builder: The financials of the builder are always a good indicator of their financial health and cash flow management. A builder with too much debt on the books or poor cash flow management is highly unlikely to be able to deliver projects on time. Delivery Record: Apart from the builders’ delivery claims, home buyers should also do a thorough check on various real estate blogs and forums to verify those claims with respect to their track record. (Some leeway can be given when a slight delay might be due to delayed approvals). Scrutinizing the sale agreement and keeping a constant check on the construction progress helps in avoiding unnecessary complications as well. Casa Grande, Chennai’s largest villa developer has one of the best records when it comes to delivering projects on schedule – having handed over possession of 40+ projects over a span of 11 years with zero delays. Casagrand has managed to achieve and maintain this impeccable track record by virtue of the following factors which help ensure our commitment to delivering quality homes on time, every time. A trained, In-house engineering team involved in the projects reduces the risk of delays caused by dependence on external contractors and sub-contractors. The active involvement of the top management in tracking the construction progress & its adherence to the project schedule helps in keeping the pressure on all parties involved to deliver on or ahead of schedule. Having multiple projects in Chennai, Bangalore and Coimbatore helps in effective cash flow management, leaving no scope for delay due to lack of funds. A large number of home buyers in India face problems with regard to timely possession of homes. For a hassle-free home buying experience with no question of an extended waiting period or added interest on home loans, checkout our wide range of villa and apartment projects at desirable locations in Chennai, Bangalore and Coimbatore.